Ever drop your phone on a ceramic tile floor face down and cringe as you pick it up only to find that you just cracked the lens of your new really expensive iPhone? Most of us have done it. I learned the hard way that investing in a high quality case to protect your phone is worth the investment and that’s why I use the Otterbox Defender for Apple iPhone 5s Case. Today, we take a look at one such case, the Otterbox Defender. Otterbox has been making cases and skins for phones and tablets for a long time. The company makes several different types of cases. The Otterbox Defender series will be covered in this review. It’s a case that I have personally used for many years, ever since I purchased my first iPhone over five years ago. Otterbox also makes a less expensive case called the Otterbox Commuter which is maybe one step up from placing a silicon skin on your phone, don’t bother with that one as it is vastly inferior to the Defender. I have dropped my phone from a standing position while on my driveway and on porcelain and never did one bit of damage. Speaking of porcelain, if anyone says they don’t bring their phone into the bathroom to kill time they are lying. Anyway, the Defender really does what it says, and that’s protect your phone from any drops or dings. I’m proof. The Otterbox Defender is composed of a plastic base that comes in two halves. It snaps around your entire phone. The case includes a built-in plastic lens for additional protection. Starting with the iPhone 5s where Apple integrated fingerprint recognition, Otterbox exposed the button at the bottom to enable the function. The Defender then includes an additional layer of protection with the rubber skin. All of this certainly adds some bulk to your phone, but it still fits in your pocket and quite honestly, I think it’s easier to handle when you aren’t afraid of dropping it all the time. The Otterbox Defender also comes with a belt clip that your phone can snap into. Who clips their phone to the belt these days? Nobody. You can toss that or sell it online for a few dollars. The outside of the Otterbox Defender has molded button that correspond to the on/off switch at the top and the volume buttons on the side. The buttons are completely functional and not hampered in any way from the Defender being on the phone. Both camera lenses are exposed through the clear plastic that is integrated into the case and not blocked in any way, assuming your case remains clean. The bottom of the Otterbox Defender leaves your speaker somewhat exposed and if you pump up the volume, you will have no difficulty hearing it. It also has a flap that can be pushed aside for charging. A second flap is present for plugging in a headset. This is the only drawback I have found in using the Otterbox Defender case is that if the plug from your headphones is on the large side, it may not fit when using the Defender on your phone. This review speaks from a long time of personal experience. 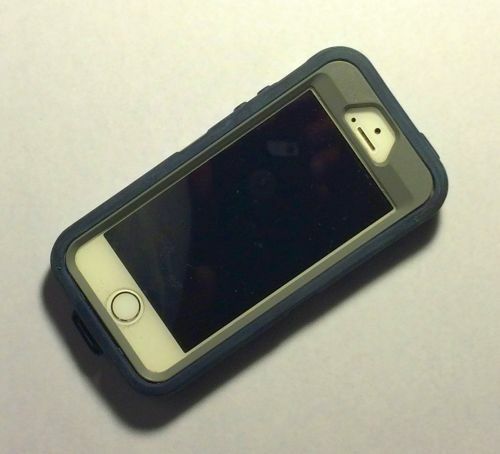 We have always used iPhones with the Otterbox Defender and that’s what this review speaks to. They are also available for many popular phones from Samsung and a lot of tablets as well. I also use the Otterbox Defender Case for Apple iPad Mini 3 it is built as solidly as the iPhone case. These cases have saved me hundreds of dollars in costly repairs. Perhaps more. While the Otterbox Defender line may cost more, it’s never let me down.